For courses in Physical Geography. Continuing Tom L. McKnight's well-known thematic focus on landscape appreciation, Darrel Hess offers a broad survey of all of the physical processes and spatial patterns that create Earth’s physical landscape. 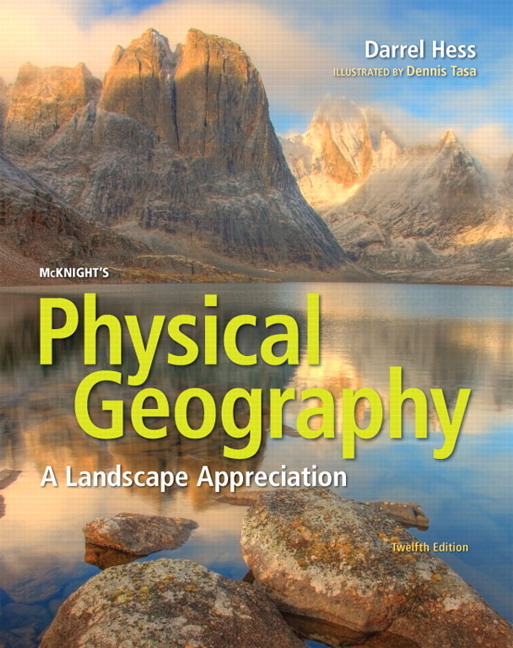 McKnight’s Physical Geography: A Landscape Appreciation provides a clear writing style, superior art program, and abundant pedagogy to appeal to a wide variety of readers. The Twelfth Edition offers a truly meaningful integration of visualization, technology, and the latest applied science, providing essential opportunities to teach and engage readers in these processes and patterns. Topics that are tied to readers’ real-world concerns such as global environmental change, along with new videos, photography, online lab resources, and updated interactive tools, make it the most effective learning program for physical geography. This title is also available with MasteringGeography–an online homework, tutorial, and assessment program designed to work with this text to engage students and improve results. Interactive, self-paced tutorials provide individualized coaching to help students stay on track. With a wide range of activities available, students can actively learn, understand, and retain even the most difficult concepts. Note: You are purchasing a standalone product; MasteringGeography does not come packaged with this content. Students, if interested in purchasing this title with MasteringGeography, ask your instructor for the correct package ISBN and Course ID. Instructors, contact your Pearson representative for more information. NEW! Global Environmental Change features written by expert contributors provide brief case studies on critical issues related to environmental change. NEW! Practicing Geography references highlight geography and science being practiced in the real world, emphasizing people in scientific jobs, to help readers see job opportunities in geoscience, and to put a more human face to the topics and science. NEW! Have You Ever Wondered...? chapter-opening inquiries present familiar real-world phenomena related to the chapter and work with Big Questions and Seeing Geographically features, making the chapter opener a more engaging, active, and living introduction to the chapter. UPDATED! Energy for the 21st Century features, most written by expert contributors, provide balanced coverage of both renewable and non-renewable energy resources, authored by expert contributors. UPDATED! People & the Environment boxes, some written by expert contributors, discuss the effects of human activity on the environment. UPDATED! Focus features, many written by expert contributors, present in-depth case studies of special topics in physical geography. NEW! Environmental Analysis activities at the end of each chapter provide users with a higher-level application exercise, sending students outside of the book to analyze data and perform other higher-order learning tasks. Hundreds of maps with shaded relief where appropriate. Line art with numerous multi-part photorealistic illustrations that capture sequence and evolution to help students understand various processes. Major photos paired with locator maps to enhance geographic literacy. UPDATED! Quick Response (QR) Codes link to video and animation resources as a means to provide students with just-in-time access to visualization media tied to major concepts. UPDATED! Seeing Geographically questions at the beginning and end of each chapter ask students to perform visual analysis and critical thinking to check their understanding of key chapter concepts and overcome any misconceptions. Expert Contributors author most of the special Global Environmental Change, Focus, People and the Environment, Energy for the 21st Century, and Environmental Analysis features, providing a variety of expertise and experience, as well as current data incorporated to ensure the latest science, statistics, and associated imagery. UPDATED! Key Questions work as chapter-specific learning outcomes that connect to Learning Checks, End of Chapter Questions, and Learning Outcomes in MasteringGeography. UPDATED! Learning Checks integrate review questions at the end of chapter sections, helping students check comprehension. All boxed features will now include Checkpoint questions. UPDATED! Review & Study Questions at the end of every chapter give students the practice they need to learn and master the material. Language, Consistency, and Connections have been improved with more consistency among features and concepts, and less formal and abstract language. Modernized Design including fresh colors, fonts, and larger imagery. The Test Bank includes Bloom’s Taxonomy and correlations to global and text-specific student learning outcomes to give instructors more options for assessing their students with a higher order of learning and efficacy standards. Assess student progress with MasteringGeography. Powerful tracking tools in MasteringGeography allow instructors to see how an individual student is progressing through the course compared to the class and the national average. Instructors can tackle areas where students are struggling right away, ensuring that every student has a chance to succeed. Instructor Resource DVDs provide instructors with everything they need to prepare for lecture and support their course electronically in one convenient place. This title is also available with MasteringGeography—an online homework, tutorial, and assessment program designed to work with this text to engage students and improve results. Interactive, self-paced tutorials provide individualized coaching to help students stay on track. With a wide range of activities available, students can actively learn, understand, and retain even the most difficult concepts. NEW! 20 Mobile Field Trip videos for geography from Michael Collier take students out into the landscape, providing an interactive avenue for exploring landscapes and the major themes of physical geography. The videos are QR-linked from the printed book, and are available for assignment with assessment in MasteringGeography. NEW! MapMaster 2.0 Interactive Map Activities are inspired by GIS, allowing students to layer various thematic maps to analyze spatial patterns and data at regional and global scales. Now fully mobile, with enhanced analysis tools, students can geolocate themselves in the data and upload their own data for advanced map making and spatial data analysis. This tool includes zoom and annotation functionality, with hundreds of map layers leveraging recent data from sources such as the PRB, the World Bank, NOAA, NASA, USGS, United Nations, the CIA, and more. NEW! Video Activities from sources such as the BBC, Financial Times, and Television for the Environment’s Life and Earth Report series provide students with applied real-world examples of physical geography in action, a sense of place, and allow students to explore a range of locations and topics. Full eReader functionality includes page navigation, search, glossary, highlighting, note taking, annotations, and more. A responsive design allows the eText to reflow/resize to a device or screen. eText 2.0 now works on supported smartphones, tablets, and laptop/desktop computers. UPDATED! Geoscience Animations help students visualize the most challenging processes in the physical geosciences with schematic animations that include audio narration. Animations include assignable multiple-choice quizzes with specific wrong answer feedback to help guide students toward mastery of these core physical process concepts. Pre-Lecture Reading Quizzes ensure students complete the assigned reading before class and stay on track with reading assignments. Reading Quizzes are 100% mobile ready and can be completed by students on mobile devices. Pose a variety of open-ended questions that help your students develop critical thinking skills, such as sketching, word clouds, region, image upload, etc. UPDATED! GeoTutor Activities help students master the toughest physical geoscience concepts with highly visual, kinesthetic activities focused on critical thinking and the application of core geoscience concepts. Encounter Physical Geography Google Earth Activities provide rich, interactive Google Earth explorations of physical geography concepts, helping students visualize and explore Earth’s landscape and physical processes. Available with multiple-choice and short answer questions. All Explorations include corresponding Google Earth KMZ media files, and questions include hints and specific wrong-answer feedback to help coach students toward mastery of the concepts. Darrel Hess is professor of geography at City College of San Francisco, where he served as chair of the Earth Sciences department from 1995-2009. He regularly teaches physical geography, economic geography, and human geography. Hess received his B.A. in geography from UC Berkeley and his M.A. in geography from UCLA. Before grad school he served in the Peace Corps in Korea, and before teaching full-time he worked as a writer, photographer, and audiovisual producer. Hess served as T.A. to Tom McKnight at UCLA, and began working with McKnight and Pearson as author of the SG starting in the 4th edition and as author for the LM starting in the 5th edition. He became a full time co-author of the 9th edition, and became sole author of the 10th edition. Hess has contributed to the development of the geoscience animation library and has partnered with many geoscience teachers and writers in the development of the CA edition. Hess was the recipient of the 2014 AAG Gilbert Grosvenor Geographic Education Honors award. Dennis Tasa has been a renowned illustrator of many bestselling geoscience textbooks since 1978, including Physical Geography by Darrel Hess, Laboratory Manual in Physical Geology by the American Geosciences Institute and the National Association of Geoscience Teachers, as well as the physical geology, Earth science, and meteorology franchises by Tarbuck and Lutgens. He has created illustrations and media for the Mineralogical Society of America and NSF-funded projects. In addition to numerous educational Earth science apps, he has worked on various Earth science media, including Pearson’s GEODe. In his spare time, Dennis has joined the Taos fine art community by painting under the direction of the artist in residence at one of Taos’ historic museums. Tom L. McKnight taught geography at UCLA from 1956 to 1993. He received his bachelor’s degree in geology from Southern Methodist University in 1949, his master’s degree in geography from the University of Colorado in 1951, and his Ph.D. in geography and meteorology from the University of Wisconsin in 1955. During his long academic career, Tom served as chair of the UCLA Department of Geography from 1978 to 1983, and was director of the University of California Education Abroad Program in Australia from 1984 to 1985. Passionate about furthering the discipline of geography, he helped establish the UCLA/Community College Geography Alliance and generously funded awards for both undergraduate and graduate geography students. His many honors include the California Geographical Society’s Outstanding Educator Award in 1988, and the honorary rank of Professor Emeritus upon his retirement from UCLA. In addition to Physical Geography: A Landscape Appreciation, his other college textbooks include The Regional Geography of the United States and Canada; Oceania: The Geography of Australia, New Zealand, and the Pacific Islands; and Introduction to Geography, with Edward F. Bergman. Tom passed away in 2004.